It kinda drives me nuts whenever I read recipes that call for half a can of pumpkin puree -- mostly because I've never seen a half-can sized serving of pumpkin in a store before and I abhor wasting food. Mind you, some of my own recipes here on weelicious call for only that much pumpkin puree, so yes, occasionally I am responsible for driving myself nuts! Recently, I was making some mini pumpkin breads (recipe coming soon) and since I obviously had half a can of puree left over and couldn't bear letting it go to waste, I turned it into this special dish. If you've eaten gnocchi before -- a delicate, dumpling-like Italian dish often made with ricotta and potato -- you most likely had the savory kind, as light and airy as soft pillows and topped with marinara and grated Parmesan. I wanted to make a sweet version for the fall and since pumpkin's consistency is similar to potato, it came to mind as a good base. I've actually had pumpkin gnocchi with sage butter as an entree before, but my version, made with maple syrup, cinnamon and a touch of butter, is more like a dessert. 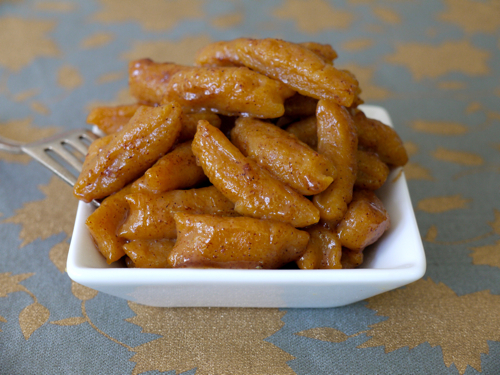 So if you happen to have a half a can of opened pumpkin puree and you want wow everyone after dinner with a special treat that is a little bit different than what they might be used to for dessert, make these sweet pumpkin gnocchi. It's even worth opening a whole can for. Just use the leftovers for this! 1. Place the first 6 ingredients in a standing mixer or bowl and mix to combine. 2. Slowly sprinkle in the flour until the dough comes together (it will be slightly wet and sticky). 3. Place dough in a lightly floured bowl, lightly sprinkle some more flour on top to prevent mositure and refrigerate for 30 minutes to 1 hour. 4. When ready, bring a pot of water to a boil and evenly divide dough into 4 parts. 5. Sprinkle some flour on a clean surface, shape dough into a long log. Using a knife, cut into rectangles, about 1/2 inch thick and 1 inch long. 6. Place gnocchi into boiling water and cook until the gnocchi floats to the top, about 1 minute. 7. Remove gnocchi to a plate and cook the remaining gnoochi in boiling water. 8. In a large sauté pan, melt 2 tbsp of butter; add the maple syrup, ground cinnamon and the cooked gnocchi. 9. Sauté for 1 minute until warmed through and coated. Oh man! This sounds amazing! Maybe a thanksgiving treat! What sauce would you suggest for a more savory dinner? Just a bit of melted butter with some sage or tomato sauce with a sprinkle of parmesan. I love that idea!! You could also melt some butter, add some sage leaves to make sage butter and saute them. OMGOODNESS This will be made as soon as I pick up some pumpkin puree. Can not wait!!! Can these be frozen before cooking or after cooking? I haven't tried freezing them, but I feel like you could make them and then freeze before cooking. Just defrost them in the refrigerator and follow the directions for cooking and then sauteing them. I haven't made these yet, but I do freeze my spinach and ricotta gnocchi so I'd imagine these would freeze just the same. For those, I cut them into pieces and then place on a parchment lined cookie sheet and put that into the freezer for an hour or two (until frozen, so they won't all stick together) and then I pop them all into a freezer bag or container. When I want to cook them, I put them in the boiling water straight from frozen and just increase the cooking time by a couple of minutes. Hmmm...what should I sub in for the cheese? We have allergies and are new to this. No good \"fake\" cheese around here, although I did make the treck to TJs recently so I do have \"cream cheese\". But for day to day stuff I'm at a loss. That's a tough one. You really need the ricotta for this recipe to make them light. Try soft tofu. I used it in place of ricotta in lasagna and it was delicious. Just puree it in the blender. I never have a problem using up extra pumpkin puree. :-) This recipe looks heavenly!! Does anyone have a sage butter recipe to go on top (or something different from the sweet cinnamon syrup) for a dinner instead of dessert? Certainly going to try this one for the Dayhome kids! This looks amazing! I am often left with half a can of pumpkin puree, so I have gotten into the habit of serving my toddlers a mix of pumpkin and applesauce with cinnamon. They gobble it up every time. Pumpkin puree freezes really well. I do it all the time, because my kids are obsessed with pumpkin pancakes and it only requires 1/2 cup or so. How long do you think an open can of purée good in the refrigerator? any suggestion for a pumpkin alternative? I've made a similar gnocchi with mashed sweet potato, so I bet you could sub that for the pumpkin. I freeze pumpkin puree in 1/4 cup \"blobs\" on a cookie sheet, then transfer to a freezer bag for storing. I always have pumpkin to thrown in my kids' pancakes, to hide in spaghetti sauce, or even make into spiced lattes. mmmmm... love this time of year, and we will be trying this recipe this week!! These turned out great! I had a hard time rolling it out and cutting them because the dough was SO sticky, so I just rolled them into little balls. They still look cute! I made this for the first time. My 3 yr old loved it!